A John Deere tractor from Hello Tractor ploughs a field in Narok County, Kenya. Humans have been farming the African landscape for thousands of years, and not a great deal has changed over the many centuries. The slow rhythms of the agricultural seasons are what really drive this continent with more than 60 percent of the population working on the land. But change is afoot. Digital technology is introducing remarkable innovations to agriculture through accessible mechanization, improving farmers resilience to shocks like floods, and identifying land improvements. 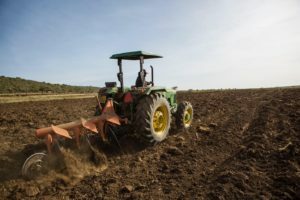 The mechanical power of the tractor revolutionized agriculture in the northern hemisphere, but most African farmers cannot afford to mechanize. Hello Tractor is providing farmers with an affordable alternative. Using a smartphone app, farmers can book tractor services like ploughing, hauling and planting. If they don’t have a smartphone, they can book through an agent who is paid via commission. The technology links tractor owner/operators with farmers needing tractor power. It has been called the Uber for tractors, but CEO Jehiel Oliver doesn’t really see it like that. He says it is about supporting the tractor operators and delivering a quality service. He happily admits to learning a few lessons since starting Hello Tractor in Nigeria five years ago. “We started by selling our tractors and booking using SMS (text messages),” explains Oliver. But it was a tough economic environment at the time in Nigeria. “Recession forced the price of the equipment up and forced us to look at where we add value. We decided to focus on the technology, to focus on tractor fleet management and the booking app. This is our added value to a complex market,” says Oliver. Hello Tractor now partners with John Deere, whose famous green and yellow machinery can now be seen working African farms. Some 75 percent of the new tractors sold in Nigeria in 2017 were fitted with Hello Tractor’s GPS device. This device provides invaluable data on where and how the tractor is being used, such as distance travelled, time in use, and maintenance needs. And the partnership is not just about quality equipment. “John Deere does a great job in training its owners on use,” explains Oliver. Hello Tractor is using this training to match the best tractor operator for the job to improve quality service for farmers. Through a new partnership with IBM, Hello Tractor uses artificial intelligence (AI) to decide which tractor/operator should be sent out for a particular job. From its roots in Nigeria, Hello Tractor is now operating in Kenya, Ghana, Senegal, Tanzania and Mozambique, as well as Pakistan, Bangladesh and most recently India. Both John Deere and Hello Tractor will be at ICT4D Conference 2019 which starts in Kampala, Uganda, on April 30. ICT4D Conference founder, Catholic Relief Services (CRS) is also using digital technology to boost agriculture in varied and innovative ways. UBALE (United in Building and Advancing Life Expectations) is a notable USAID funded project in Malawi which is working to build the productivity and profitability of some 250,000 smallholder farming households. Farmers are guided along the pathway to prosperity with improvements to agriculture like water management, market access, health activities, and savings and internal lending communities (SILCs). It is also a potentially huge boost to projects like UBALE if project managers can determine which households are the most resilient or the most vulnerable to shocks like drought or flooding. Jenny Haddle, MEAL (Monitoring, Evaluation, Accountability and Learning) Coordinator on UBALE explains how technology is opening this door. “MIRA (Measuring Resilience in Malawi) is using data collected on the CommCare app to measure households’ resilience to these shocks,” she says. Data is collected via a questionnaire and analyzed by machine learning as part of a partnership with Cornell University and Cooper/Smith in the US. The results are presented in an Excel spreadsheet or dashboard for accessibility and further analysis. “The data shows which part of CRS’ work is contributing to resilience and can predict food insecurity,” explains Haddle. The data showed that the households that are more vulnerable to illness and shocks are households that are headed by women. While the households that bounce back fastest from damage like storms tend to have land both inside and out of flood-prone areas. CRS is also piloting a digital information collection system called Farmbook to gather data from farmers such as how much they spent producing a crop and how much profit they made. “This is a great tool to interact with the farmers and advise them with,” says Haddle. Further north in Ethiopia, CRS is using GIS (geographic information system) mapping data to gather and analyze information on the land used by smallholder farmers. The mapping data can be presented on Microsoft’s Power BI visualization tool and shown directly to farmers. The software is called Collector for ArcGIS. It can be used to map the location of farms and other project infrastructure constructed with support of the project including farmer training centers, irrigation schemes, water points, and food distribution sites. All this information comes in handy in helping to decide on additional improvements for farmers. The technological revolution underway in African agriculture is truly showing that digital technology is not just an urban phenomenon and that it is transforming lives for the better far from tradition centers of hi-tech innovation.